This work is covered off partly on this web site but does have its own dedicated site where the articles, post and thinking have been building up over a fairly lengthy period. Go and visit it at www.innovationfitnessdynamics.com. So let me tell you what this is all about and I will describe this with heavy referencing from Geoffrey Moore’s book “Dealing with Darwin”. Without doubt one of my favourite books in how it helped me piece together a large part of my dynamic innovation fitness puzzle. First you have the internal view. Critically, you need to take a fresh look at your internal dynamics, at what happens when core competencies cease to differentiate, how resources must be shifted to new areas, how deeply threatening such changes can be, how a protective inertia emerges as the enemy of destabilizing innovation, and finally, what kinds of management responses can best deal with inertia and redirect its energy towards fresh innovation. This is the inward facing dilemma that needs to be addressed. It is about creating competitive advantage in an increasingly commoditizing world. To lead that effort, you must continually reappraise what role your company is playing in the market ecosystem, how the market landscape of competition is changing and understand where your competitive advantage has come from in the past and where it is likely to come from in the future and with what kinds of differentiation will be most rewarded, and what kinds of innovation are most required. This is the outward facing portion of the story. Innovation and inertia: we often get stuck in particular types of innovation, promote given skills to the detriment of others, equally necessary but ignored or not understood fully. We fail to adapt to market changes, we fund to much of one type of innovation to the exclusion of others and in the process create internal traffic jams of sorts, frustrations and tempers to match. We squander our scarce resources of time, talent and management attention on initiatives that fail to give us competitive advantage and get constantly impeded by these forces of inertia all around us. Indeed, the more successful we have been in the past, the stronger the resistance to any subsequent change in the innovation course. So what does keep management up at night about their performance on innovation? The rising anxieties stem from that worry that perhaps we are losing our ability to innovate, can our people still compete? Do we really get it? And even if we do, can we still get it to the market place at the right time and feed that need? Can we actually see the light of day? Evolution proceeds more gradually but in times of crisis we are forced to make choices that enable you to step back and reflect. I would argue we are all increasingly facing our own types of crisis in today’s volatile world. If you were able to achieve an understanding that is based on more informed choice, so you can extract yourself from one path that makes you increasingly vulnerable and provides support to commit to a new core focus, one that offers you a more sustaining competitive position on which to compete through innovation. Would you take this different pathway? Your task, challenges and keys to unlock your dilemma lie here. 1. The task is to develop a suite of core innovation competencies with proven capability to create (unique) competitive advantage. 3. The key is to identify and then to extract (scarce) resource from (existing) context and re-channel this into the new core that will differentiate you through the new emerging innovation competencies and systemic approach. Survival of the fittest dominates irrespective. We are all caught in this Darwinian race- all of us it seems. So where do you want to focus your limited resources? The ‘natural selection’ choice to increase your abilities to innovate linked to your needs. Start by mapping out your innovation direction to the tasks and capabilities on hand and those needed or required to get you to certain predefined goals. Chose the path that will leverage and expand your knowledge, capabilities and capacities and start the journey. Start recognizing the opportunity spaces and gaps when you think you should be heading but feel you might have constraints in moving towards. The greater you can identify the need for improving your ‘innovation fitness’ allows you to get closer to accelerating towards the seen and yet unseen opportunities. The greater ‘innovation fitness’ equates to more value creation potential. As you learn to recognize the difference between managing the existing routines and building the new capabilities, the quicker you can absorb these new learnings within the organization, so they can become the new dynamic routines that are needed. You then begin to reduce uncertainties and strengthen the true innovation capabilities you need to thrive and survive in this Darwinian world. Then simply contact me. I am happy to discuss this and how this can be applied to your organization and what it means in engagement and commitments. You build progressively the Innovation capabilities and competencies levels to become dynamic and fitter to compete and succeed. 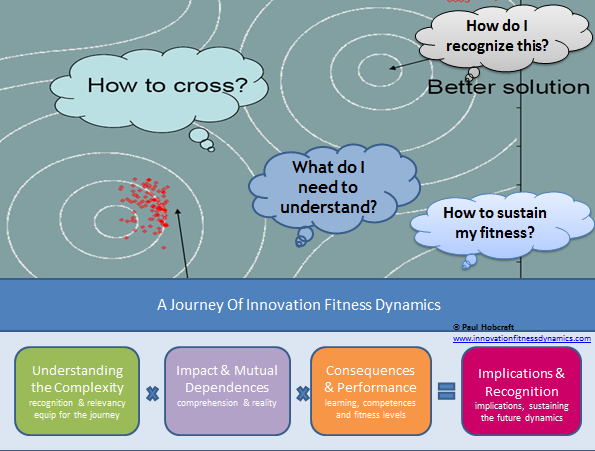 This entry was posted in Uncategorized and tagged Changing landscape for innovation, dynamic capabilities, dynamic fitness landscape, dynamics of the innovation system, fitness landscapes, Innovation & their dynamics, Innovation Structure, journey of innovation fitness, the innovation journey. Bookmark the permalink.